Twitch used to just be a platform for people to stream themselves playing video games. While it still is used for that, it has evolved to be much more, such as vlogging and general interactions. The Amazon-owned company is wise to expand, as it betters its competition abilities with the monster that is YouTube. Google's service is insanely popular, but as more and more content creators grow tired of YouTube's heavy-handed antics, they will look for somewhere else to go. That somewhere is Twitch for many. YouTube is largely a web browser affair on the desktop, while on Android and iOS, Google produces solid mobile apps. Twitch has decided to take the app approach on the desktop too, as there are now apps for both Windows 10 and macOS. 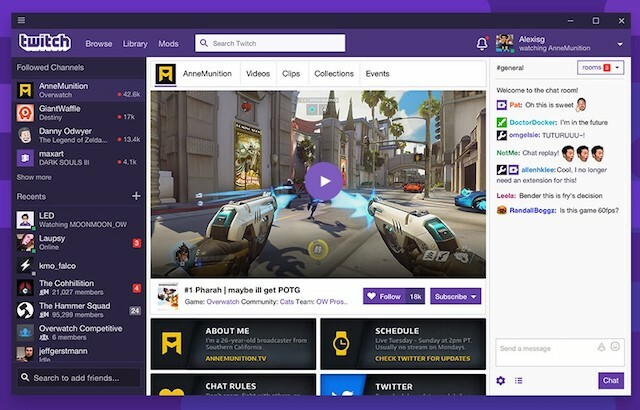 "Last spring we unveiled the Twitch Desktop App beta. Today, the summer sun brings with it the full version of the Twitch Desktop App! Our fully armed and operational app gives you access to all the Twitch you know and love, plus a ton of exclusive tools. And of course, how could we forget… Twitch in DARK MODE," says Brian Petrocelli, Product Marketing, Twitch. Petrocelli further says, "From streams to memes, everything you love about Twitch on web is available within the desktop app. Plus, because it’s an app, it's all lightning fast. Watch all your favorite VODs, clips, and of course, live streams, complete with Twitch chat in all its glory. While you’re watching, you can even support the streamers you love with Subscriptions and Bits." The app has some rather nifty features, such as "dark mode" which provides a gloomy UI and produces less light on your screen. Fans of mods will appreciate the integration with the CurseForge community. The coolest aspect, however, is the ability to video chat with friends directly from the app. Twitch even offers to sync friends from other platforms, but I could not get that to work. Unfortunately, that was not my only issue. My expectation is that I should be able to do everything from the app, but on multiple occasions, I found that clicking something would instead launch my web browser. For instance, I went to a streamer's page -- who was not streaming at the time -- and I clicked "videos" to view his archived content. Rather than display them in the app, my web browser popped up, causing a poor experience. I now essentially had Twitch open in two places. Hopefully this improves over time. My other gripe is that the app installation files are being hosted on the Twitch website, rather than the operating systems' respective app stores. On my Mac, for instance, I prefer software to be hosted on the store, as I get easy update notifications. Also, from a safety perspective, there is less risk of users getting malicious files by, say, visiting a deceptive site that hosts an altered version of the app. In 2017 it is time to embrace the App Store delivery concept, y'all. If you want to download the Twitch desktop app for either macOS or Windows 10, you can get it here. If you do try it, please share tour experience in the comments below.